Richard's Page: Riding Season Ending? 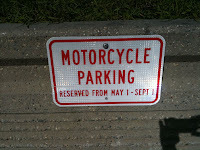 Motorcycle parking at my building is still busy even though mornings are starting to get pretty cool. 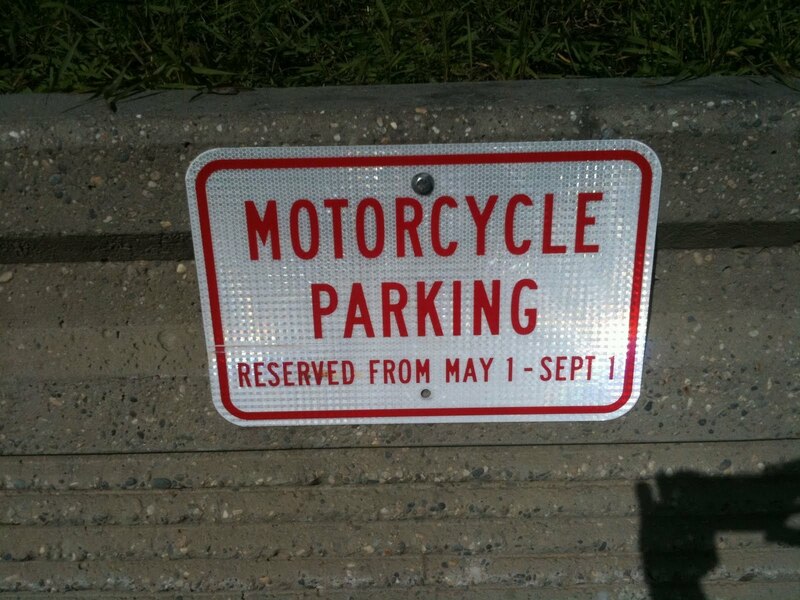 According to the "Motorcycle Parking only" signs, the reserved parking will only be in place for a couple more days, then the spaces will be available for anyone to use. I think folks are trying to get in a bit more riding before summer ends. Classes start up later this week and traffic has really picked up around campus. 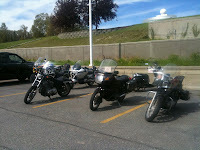 Student housing has been available as general hotel space for the summer and it was advertised on both the BMWMOA and ADVrider forums since the housing director is an active participant on both. Throughout the summer, there were always a number of riders staying in housing. I think the final number was about 350 riders taking advantage of the bargain priced housing. It seemed to be an especially popular choice with riders heading up or returning from Prudhoe Bay. After spending some time during the rally in Redmond at the Airheads tent, a couple of us decided to look into starting an Alaska chapter. There used to be one in Anchorage but it sort of faded away. After some announcements went out on a couple of email lists, the first meeting was held last week at a local microbrewery. About fifteen people showed up and that seemed more than sufficient to process the paperwork to get a new chapter set up. The purpose of the chapters seems to be a place to share maintenance and repair information for these old BMW "R" bikes with air-cooled heads and cylinders like my R100RT. We're having cooler weather this week that reminds me summer is soon over. I can deal with the cold and rain as long as I can still ride my bikes...motor and pedal. I'm not sure how I'd handle a winter without riding. I think I'd have to get one of those sidecar set ups...or maybe a snowmobile...that might be fun! There are a surprising number of folks up here who ride their bicycles through the winter. The local bike shop carries studded tires. Combined with low temperature grease, disc brakes and hippo hands, you see them out until maybe around -20F. Snowmachines, as snowmobiles are called up here, are fun but with the exception of the old dual-track tundra, very un-bike like. The tundra had a single front ski and dual tracks. Very popular for hauling and you had to really lean into the corners (with a lot of throttle) to make sharp turns. I don't think they've been manufactured for over 30 years but you still see them running around.